Following on with the photography trend we started last week, our quest for this week’s App of the Week took us farther than we’ve been before; all the way to Korea! This week, the crew at Realm is very happy to put our official support behind the iOS and Android app of Cymera, the selfie social networking service by SK Communications Co., Ltd in Korea. When Apple first announced the iPhone 4 with its front-facing camera, it’s quite possible they didn’t quite realize the magnitude of just what sort of powerful emotions they were enabling. Us humans are a passionate bunch; we love expressing ourselves and we love seeing our friends’ expressions. Because of this passion, posting pictures of yourself online (in case you’ve been living under a rock, more commonly referred to as a “selfie”) has become a very popular social networking content medium. And it turns out that a lot of users agree. 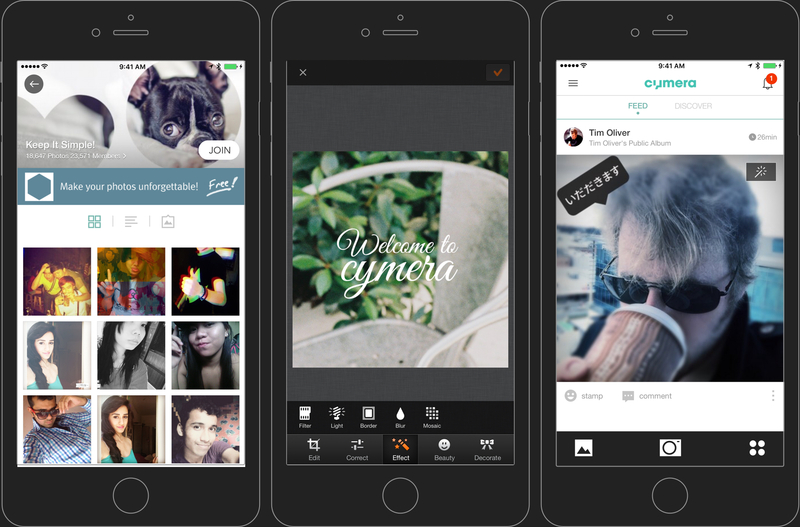 Cymera has proudly announced that they now have over one hundred and fifty million users! Holy Guacamole, Batman! Getting started on Cymera is VERY simple. You simply download the app, make an account (Which is VERY quick thanks to Facebook and Google+ integration), and away you go! Right off the bat, you can start posting your own photos, or simply browse some the publicly joinable community galleries. There is a slide-out menu from the left that provides all of the major app navigation, and the tab buttons at the bottom make it very fast to post photos. Speaking of which, posting photos via the Cymera app is absolutely amazing. If there’s an image manipulation feature out there, Cymera has it. Period. You can change the color grade, perform distortions via facial detection (like enhancing a smile! ), add tilt shift, and if all that wasn’t enough, on top of that, you can then choose to apply stickers from an absolutely vast sticker collection; all completely free! Cymera is an amazing service. With a simple concept, features that enable a truly ridiculous amount of personal freedom and expression, as well as an absolutely thriving userbase, it is a very impressive implementation. All of us at Realm are humbled that our technology was able to help enable and empower a service of this magnitude and we wish everyone at SK Communications the very best of luck in their endeavor!